Have you ever tried fasting? I have always wanted to and now finally have! I completed a 24 hour fast with one of my roommates …let me tell you it wasn’t easy, but it was worth it! After the fast this was the first meal that I made and enjoyed, it was AMAZING! We decided to do the 24 hour fast and then 3 days of a strict vegan diet. So far, it was been one and a half days of a vegan diet and I feel WONDERFUL! Not bloated at all, nor do I even really feel hungry. I thought that after the fast I would want to non stop eat, but the opposite has happened. Now, after a colourful meal of veggies am full for a number of hours until my next meal, and have no cravings for chocolate or sweets (which is UNREAL and a first for me!) but have been having a strong craving for coffee. I feel as though the coffee craving has been heightened due to the fact the it is hard to get away from coffee on a university campus and everyone either has one in their hand, had just finished one, or the delicious coffee aroma is in the air. You see what I mean?…Pretty hard to escape from it! This meal was the perfect transition into eating again, it was the right size, and was PACKED FULL OF NUTRIENTS that the body needs and craves. I would highly recommend making it for a dinner or lunch any day, since it can only provide you with benefits and happiness. Firstly, make your black quinoa on the stove top. With a 2:1 ratio of water to quinoa. So for each cup of quinoa you will need 2 cups of water. Heat up a wok on another element on the stovetop when the quinoa is almost finished. Add a small amount of oil to the wok, then add your chopped up pepper along with raw cashews. Let these heat up for a few minutes until the cashews are lightly browned and the peppers cooked. Add in the frozen corn, and stir around for a few more minutes. Remove from heat. 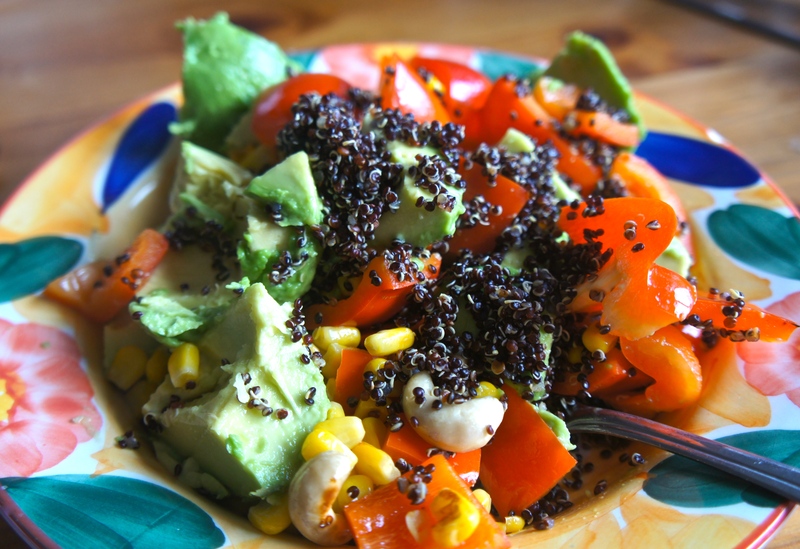 In a bowl or plate add the quinoa to the bottom, add on top your wok ingredients and then slice up your avocado and put it onto. Stir all together and LOVE LIFE!